The Hornet gives way to Super Hornet and F-35C. U.S. Navy legacy Hornet completes last cruise aboard an aircraft carrier. USS Carl Vinson (CVN 70) aircraft carrier returned home to Naval Air Station North Island in San Diego, April 12, after completing a scheduled three-month deployment. It marks the end of its mission in the Indo-Pacific, but also the last cruise for the F-18 "Legacy" Hornet. The USS Vilson had embarked four Fighter Squadrons, including the VFA-34 "Blue Blasters" which is the last USN Squadron that operates the Hornet on ships. According to The Drive, the VFA-34 will transit to the F/A-18E Super Hornet next year. The "Blue Blasters" will still operate from Vilson's flight deck this summer, but it will be a quick deployment, just for training. 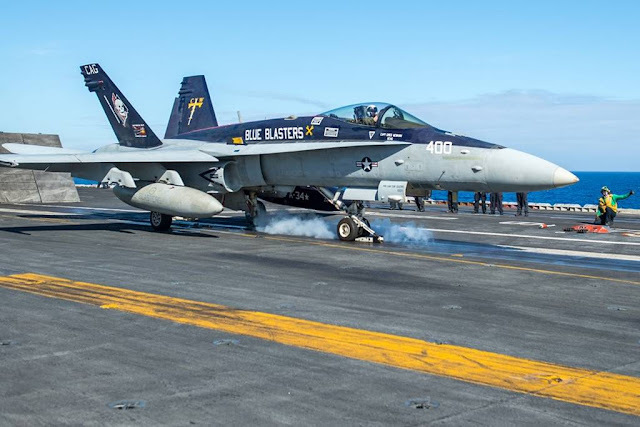 The Hornets will still remain in the U.S. Navy fleet for various tasks, such as the role of Aggressor and support for the Squadrons that will have to transit to the Super Hornet. The VFA 147 "Argonauts" has recently begun the transition to the F-35C, this marks the beginning of a new era for the U.S. Navy that in the future will be able to deploy on the ships mixed fleets composed of F-35s and Super Hornets. The "Argonauts" are the first USN Squadron to fly the new fifth-generation stealth fighter. Last week the USS Truman left the seaport of Norfolk for a new deployment in the Mediterranean Sea and her flight deck doesn't host Hornet fighters.